Before the Mini Traveller, now called the ‘Clubman’, became a larger rebadged BMW 1 Series, it looked like this. This is the van variant, of which over half a million were produced until the early 1980s, but with a payload of just 1/4 of a ton it wasn’t going to trouble Ford’s Transit. However, the Traveller van was perfect for light-duty work nipping down city streets, which is what Flickr’s Peter Schmid has deployed his to do, delivering pizza for Al Capone’s pizzeria. Based on the official LEGO 10242 Mini Cooper Creator set, Peter has faithfully replicated the van version of the iconic original Mini, complete with the famous twin barn doors at the back. Place your pizza order at Peter’s photostream via the link above. Well, this is a Mini, but not a normal one. Designed to sell to the world’s militaries, the Mini Moke was an ultra lightweight off-road vehicle built for ease of travel and maintenance. And it did those things pretty well, being based on the standard Mini passenger car and being light enough to be picked up by its bumpers. However, at the one thing the Moke really needed to do well, the off-roading stuff, it was a bit hopeless. Low ground clearance (and low power) meant the little car got stuck a lot, and even the addition of a second engine in the rear to give the Moke four-wheel-drive failed to convince any major militaries to back it. Looking for a way to recoup their investment, the British Motor Corporation re-marketed the Moke as a fun car for civilian use, and in a few places – notably Australia, the Caribbean and parts of the Mediterranean – turned their initial failure into a quite a success, and the Moke has now become something of a cult car in these markets. This lovely Lego version of the unusual Mini, built to match the scale of the official LEGO 10242 Mini Cooper set, has been built by Ritto Aydillo Zuazo of Flickr, and it’s a faithful recreation of the odd original. Ritto is hoping that his Moke replica can become an official LEGO set via the LEGO Ideas platform – to see all the images and to give it your vote check it out on Flickr via the link above. Minis seem to be popping up all over the place here today. Well this isn’t a Mini obviously, but it has been built exclusively from the parts found within the 10242 Mini Cooper Creator set. Like the Porsche 911 RSR featured here earlier today the builder of this 10242 alternate hot rod model has made instructions available, so that if you own the Mini Cooper set you can build your own. You can see more courtesy of Serge S on Flickr. 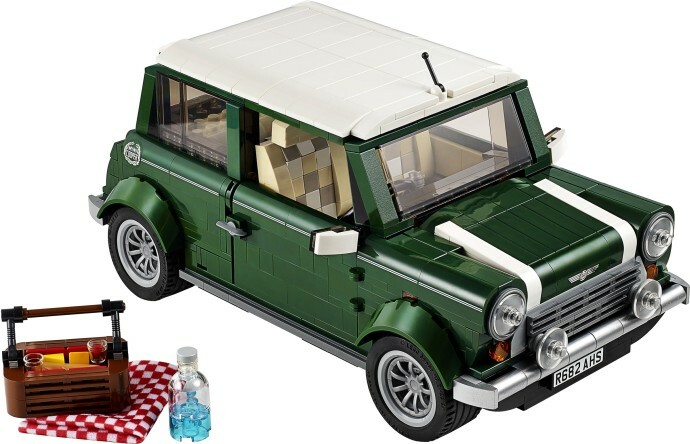 LEGO’s 10242 official Mini Cooper set is a firm favourite here at TLCB Towers, but that’s no reason to stick to the prescribed instructions. Suggested to us by a reader, amaman of MOCpages has used the Mini’s excellent parts range to build something just a little bit quicker… Porsche’s monster 911 RSR. There are opening doors, hood and engine lid with a detailed interior an engine inside, and amaman has even photographed the build steps so that if you own 10242 you could build your own RSR too. You can see more of the build and check out how amaman has done it via the link to MOCpages above. LEGO’s 10242 Mini Cooper set received an excellent review here at TLCB earlier in the year, but Flickr’s Dornbi decided that his copy could benefit from a few, er… ‘household’ modifications… modifications that Mr. Bean was forced to put into practice back in 1994 following an eventful trip to the January sales. You can see more of Dornbi’s brilliant modified 10242 set on Flickr at the link above, and the unique approach to automotive packaging by Mr. Bean on which this model is based by clicking here. *Allow us to explain; Today’s post is a small version of a bigger version of a big version of a small car. See? It makes perfect sense! OK, we’ll try again… This excellent Technic creation is a scale model of Mini’s largest model to date, the not-at-all-mini and actually quite large Countryman. The Countryman is itself a grotesquely swollen version of the ‘new’ New Mini, and the New Mini is of course a modern (read ‘larger’) re-interpretation of the original small British car from 1959. There you go; TLCB’s tenuous logic in action! Back to the model, and it’s been built by falconluan of Brickshelf. It includes remotely controlled drive and steering, selectable all-wheel-drive, opening doors, hood and trunk, working suspension, and a transversely-mounted inline-four piston engine, which makes it one of the most thoroughly executed Technic Supercars of the year. There’s a fittingly massive gallery of photos available, including several detail and component images, at Brickshelf via the link above – click the link above to make the jump. Tagged 4x4, Countryman, Lego, Mini, power functions, rc, Remote Control, supercar, Technic, Who Ate All The Pies? Well this is something we never imagined we’d be posting… Sariel has, er… ‘modified’ LEGO’s official Mini Cooper set and given it legs! Creepy spidery moving legs. You can see the Walking Mini in action on MOCpages, plus you read Sariel’s interview with TLCB here, and you can read our review of the official (wheeled) 10242 Mini Cooper set by clicking here. Discovered by both a very excited TLCB Elf* and a TLCB Reader, today we’re bringing you seven models in one! TLCB favourite (and previous Master MOCer) Nick Barrett has beautifully reconstructed six cars that he’s previously owned, plus a truck on which to transport them. The truck steers and the trailer has a realistic mechanism to allow the cars to drive on, but really it’s all about that payload. See if you can identify all six of Nick’s eclectic cars before visiting MOCpages or Flickr to find out if you’re right! *Which did of course try to ague that 7 meal tokens and 7 smarties were an appropriate reward. It did not win its case. Welcome to our review of LEGO’s latest set for gearheads. If you’re from the UK and of a certain age, there’s a good chance your first car was one of these. Probably ten years old, falling apart with rust, smoking like the Flying Scotsman… maybe that was just mine, but how I loved it! Where were we? Ah yes, 10242, what’s it like? Comparisons with the 10220 Camper Van (still available but probably not for long…) are inevitable, and 10242’s 1077 pieces for £75 looks slightly worse value than the Camper’s 1332 pieces for £80. Naturally, the model’s smaller as well… still, all those rare pieces in dark green make up some of the difference for MOCers. The box looks to be the same size as the VW’s, and it looks good, with a tempting pic of the Mini on the front, and the rear showcasing all the opening features and interior detail. Appetite suitably whetted, it’s time to liberate the instructions and get to building. After a not-too-taxing couple of hours, you’ll have a good looking model. The front looks excellent. The lights, grille and bumper are all in proportion and the sloped bonnet opens to reveal the detailed engine. This isn’t quite as detailed as it could be, but what’s there is nice enough. In answer to many a MOCer’s prayer, the headlights are about two and a half studs across which makes them exactly the right size. Hurrah! for that. The silvered pin joiners used for the bumpers are very pleasing too. Those green wheelarch pieces are brilliant, though. Nice going for what’s really a windscreen piece! The wheels are nice too, doing a convincing impression of the ‘Minilite’ design that was always popular on these. At the rear, another nice and shiny bumper, above which is an opening bootlid that’s almost but not quite exactly the right shape. It’s a good try, though. Maybe it’s the too-steep angle of the rear screen that does it, but it doesn’t look quite right from some angles at the back. And another thing; when are LEGO going to stop using tiny minifig levers where something three times the size would be better? Answers on a postcard please… It’s the roof-mounted aerial this time and it looks ridiculous. Inside, it gets better. The roof lifts off to reveal the beautifully detailed seats with their chequered trim, and a perfectly detailed dashboard with the sort of late – ’90s wood veneer that was almost definitely not plastic… The front seats tip forward to allow your imaginary figures into the cramped rear bench. This is a couple of studs too far forward, presumably to give enough boot space for that utterly delightful picnic basket, complete with fabric towel. And a piece of ‘cheese’ that’s actually a piece of cheese; gotta love that Danish humour! The only criticism inside is the massive steering wheel. One very nice detail is a choice of number plates according to your chosen European country. The English ‘R’ registration makes this a 1997 model. Also very English is the colour: British Racing Green, no less, and it looks great with the white bonnet stripes and roof. Overall, it’s a good model. A nice thing to have if you’re a Mini fan. It doesn’t quite achieve the dizzy heights of quality of the Camper set, though. No bib around your Gregory Peck today, eh? Oh yeah, Miro Dudas has updated his previously blogged Mini Cooper to Italian Job spec! See more here! 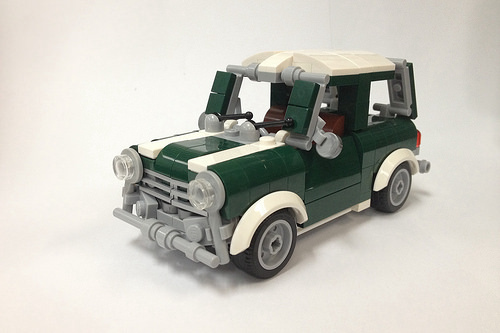 LEGO’s 10242 Mini Cooper has already started to inspire builders to produce Mini MOCs. This example is from Miro Dudas, over on Flickr. It features a very neat solution to finding small parts suitable for the Mini’s distinctive headlights.